Wendy MacLennan has a mission to create a teen mental health revolution. 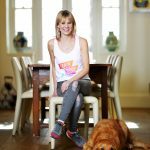 Last September she set up the Train Body Brain method, a 45-minute fitness nirvana to enable teenagers to take control of their own physical, mental and spiritual well-being. The sessions involve high-intensity interval training, positive affirmations and mindful meditation. Wendy explained that setting up Train Body Brain came about partly from witnessing the stress of her own teenagers, especially during the transition through secondary school. She also became aware of the epidemic of young people feeling anxious and depressed. We live in a world where it is difficult to have true images of ourselves. Photo-shopped images abound, and Instagram promotes insecurity when everyone’s lives seem full and exciting. There is an expectation that everything has to be perfect. Add to that the stresses of school and exams, and there is a problem: 75 per cent of mental health issues begin in adolescence, and rates of anxiety and depression amongst teenagers have increased by 70 per cent in the last 25 years. Wendy feels a duty of care as an adult and parent to give teenagers the tools to navigate the world for themselves. She prefers some of the more positive statistics coming out of the States: the State University of New Jersey found that aerobics and mindfulness combined and done twice weekly show a 40 per cent reduction in depression, and the evidence after a Train Body Brain class corroborates this statistic. Wendy is also extending into the workplace: she has been asked by a large branding company to teach staff once a week at the beginning of the day. She feels fortunate to have had guidance from ReebokWomenUK, and was invited to speak on the Reebok One stage at BeFit: London festival last month. She has also been invited to take part in Parallel London, a health and fitness forum being held at Olympic Park in September for people with disabilities. While girls readily get involved in the method, boys can also benefit and are keen. When Wendy taught Year 7 boys last term at a London boys’ school, she noticed the difference between girls and boys in their attitude. The boys were more lively and vocal during the exercises, letting off steam; and when it came to meditating, they became calm and quiet. A typical session is 45 minutes long; it’s relaxed, low key and for all fitness levels. There’s a different playlist every week, as well as a different theme: for example, the ‘Self-Love Workout’, the ‘Abandon Anxiety Workout’, or the ‘Radically Resilient Workout’, to name a few. The class starts with a dynamic warm-up, which includes setting an intention to get rid of any negative feelings. Students are encouraged to dedicate the workout to themselves and their well-being. This is not about school or their parents; it’s time just for them. The class proceeds through HIIT, High Intensity Interval Training, which involves short intense bursts of exercise for 45 seconds, followed by 15-second rest intervals. Throughout the exercises, students are encouraged to make a variety of positive affirmations which change each week. Wendy hopes that by repetition one or two may stick and be of use outside of the class. In terms of physical outcomes, the core, legs and bottom are worked on throughout the exercises; but this is not about changing the body, it’s about how the body makes you feel, not look. The message is that you are perfect as you are. Wendy encourages her class to see their bodies as a friend which has feelings, instead of constantly criticising themselves. Through bends and crunches, pupils learn that when things don’t go to plan we bend, we don’t break. The final part of the session, following the cool down, is the mindful meditation. Everyone lies down on their mats, the lights are turned off and soothing music is switched on. Wendy encourages everyone to become aware of their breath; they should imagine inhaling relaxation, and exhaling tension. They are guided to notice the nature of their thoughts, feelings and where they are holding any tension in their bodies. It’s a powerful way to create calm, and a useful tool before an exam to get rid of the fight or flight mechanism. Feedback from classes includes experiencing better sleep. We currently have an epidemic of sleep problems, as teenagers spend so much of their time on screens. The classes help to flood the brain with serotonin and endorphins which affect mood, behaviour and sleep. Wendy’s classes are growing in momentum. People keep coming back once they’ve started: mostly because they feel they’re of benefit ‒ but also because they love them.